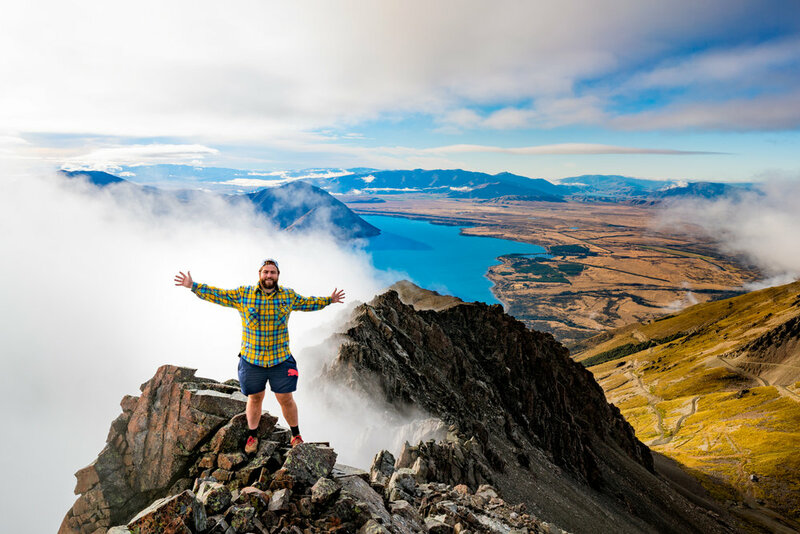 Talman Madsen: Finding myself at home with this breathtaking view from high above Lake Ohau. Lyzadie: Hello Talman. It is a privilege to talk to you today. As a brand we are passionate about all things New Zealand and love connecting to its beautiful landscape. Our first two collections are inspired by New Zealand, one by its landscape – the braided rivers, which we will talk more about later, and the other by an iconic New Zealand plant - the fern. Through your photos, we get immersed in the awe inspiring landscapes of New Zealand. We want to know about you as a photographer, adventurer and storyteller. Please tell us a bit about you. 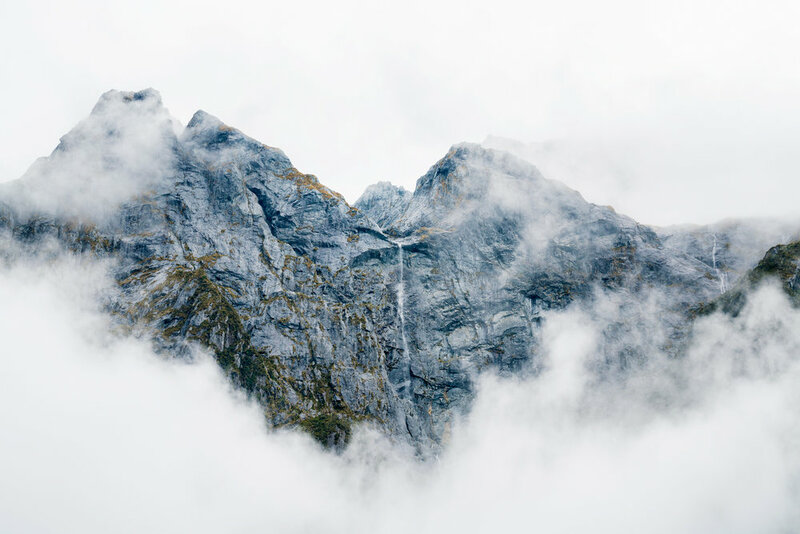 Talman: I guess my photography journey started years ago when my brothers and I decided to do a big road trip from Auckland to Queenstown. I am the oldest of five and one of my younger brothers decided to move down to Queenstown. I had done Outward Bound when I was younger and had been to the South Island a couple of times, but never explored it. The trip was the first real opportunity I had to actually take it in. I will never forget the first moment when I was driving down the coast. It was a beautiful blue sky day; on one side, the water was shimmering off the back of a rugged black sand coastline with rocky outcrops. On the other side, we had beautiful lush green bush with Nikau palms sticking out. I was just mesmerized. I took a lot of photos on that trip and that was really the moment I was creatively awoken. I guess you could call it that, and then I started taking these photos and the more photos I took, I realised I didn’t want just to take photos of flowers, pets and kids – or street photography. For me, the journey to get the photo was as important as the photo itself. It was all these things coming together that provided me with that sense of fulfillment. As I continued on this journey, I found myself going further and further out of my way to take these photos on these adventures - getting up early driving up for hours to get to some awesome location. It was all about “what is the next adventure”. Then it came to the point where I asked myself “how do I share this with people? How do I bring them along and how do I get these stories out there?” Social media has been a big way for me to tell those stories and equip people with the stories behind the photos. My book has also been a good way to share these photos, my journey to get there and what excites me about the places that I go to. 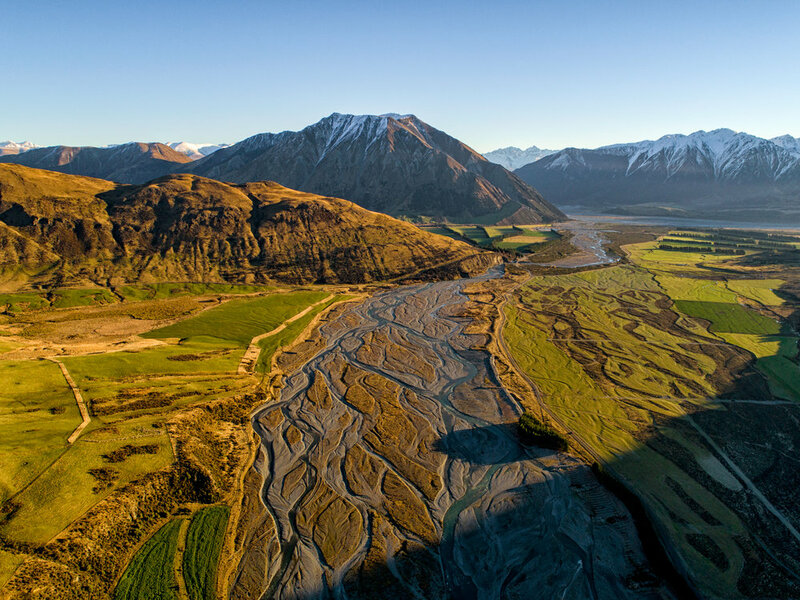 Lyzadie: What is so special for you as a photographer about the landscape in New Zealand? Talman: The first thing I say to people is that you have to try really hard to take a bad photo of New Zealand because it is so beautiful. The thing I really love about it, is how diverse the landscape is. You have beautiful mountains and rivers and forests, you have the big fiords in Fiordland, and the Sounds, the lakes, the plains, the islands, the volcanoes, rugged beaches, beautiful white sand beaches, etc. We have it all and in close proximity. I spent a bit of time travelling in America a couple of years ago and although it was beautiful, I found it was often very long distances between each location. Whereas here in New Zealand, in a couple of hours (or less), you can be in a completely different environment. That has an effect on people. Its like we are always being strung along, kind of like being in a rabbit warren and you just keep on being pulled into it and into it and before you know it, you have lost yourself, but this time with the varied beauty that’s all around us. I love that. I think it is so cool. It feels like everything we have here is so beautiful and so well designed, put together. One of my favorite things is the trees, and I say this because often you can look at our forest and think it is not beautiful or uniform like these pine forests overseas. But when you catch the light on a beautiful day, early morning or late afternoon, they just come alive and they are so fine, so colourful and radiant and the forest is almost teasing us. It is the same with the mountains; the alpine glow is like this big tease. It’s so beautiful yet it has these depths and layers to it. You can appreciate it from a glance but then the more you pursue it, the more complex it gets. As a photographer, I really enjoy the intricacies and complexities and trying to tell that story in a single image. It’s a challenge! Lyzadie: As you know, we were inspired by the braided rivers of the South Island of New Zealand for our first collection, which we launched in March 2018, called the Flow Collection. We are very much in love with these rivers and the patterns they make seen from the air. Their beauty, their patterns and their connection with the flow of life has struck a chord in us. You have taken lots of photos of them. Why are you passionate about them? What do they represent to you as a person who spends lots of time taking the best shots of braided rivers? Talman: The thing I love about the braided rivers is that it kind of sums up a lot of what I have been talking about. It’s all about the journey. There are so many different paths that you can take along that journey and some of them are fast and some are them are slow. Some of them are thin and some of them are wide. Yet they all come together, all those beautiful different paths. This unpredictability seems like a metaphor for life. There are different twists and shapes, any one of which, when zoomed in, could have negative connotations yet I love it when you view them from the sky as a whole you can see from start to finish. There is this nest of everything coming together to create this beautiful piece of art. Lyzadie: You mentioned you were going on another adventure this Friday. A lot of people envy your job, well I know I do. How do you decide on where to go next? How do you prepare for your next adventure? Does the weather and or seasonality affect your decision on where to go? Talman: A lot of my decision making comes back to instinct, adventure and wonder. Often I will look at a map and ask myself what’s there? I have this really insatiable desire to drive to the end of gravel roads, any road. Even if it is just to find a cul-de-sac and nothing of interest. I have even travelled half way down, and I got the feeling I am not going to find anything, but I still have to go to the end because if I don’t I know then I am going to come back again and do it anyway, so I may as well tick it off now and see what’s there just in case. That leads me to some really interesting places and there have been times when I have ran out of petrol (chuckles…) or it’s taken way longer than I expected. But that’s all part of the journey. I guess when I am looking at locations I don’t really like to scout and do heaps of research online. I really love the feeling of experiencing a place for the first time. When I do that, what stands out about that location or place is so much more prominent and strong if I have never been there before or seen it. I am just wary that if I go somewhere and I have seen a photo of that location or read someone else’s blog or video about it, I will be influenced by how they experienced it and I want to avoid that at all cost. In terms of preparation, I am always carrying multiple cameras with me - my operating camera, then a back up. I am up to two cameras and seven lenses, two drones and then multiple tripods, back up systems, laptops, portable batteries, power banks, etc. It’s heavy, so depending on where I am going, some of that gear will stay in the car. Recently, I did a trip to Great Barrier. I flew there. The allowance was 20kgs but I had 40kg so I got stung with a bill. I could not get rid of any of it. I am one of those people who loves to be prepared. As to weather, I know a lot of people who spend hours pouring over weather maps and looking at the forecast, but in my experience, it’s never been one hundred per cent right. There have been times when I have looked at the weather and the weather forecast and decided not to go out and then missed some incredible light and then there’s been times when I have looked at it and said I better be out there and it’s been not at all what I was anticipating. So it got to the point where I have learnt I can’t change the weather and so if I am going to go, I am going to go regardless of the weather. It’s made life a lot more enjoyable. One example is, I did the Routeburn earlier this year with some other photographer friends and we had a very wet few days. It was very interesting - some of them just chose not to take their cameras out because they could not see the full vista. They hiked through without stopping to smell the roses so to speak. One of my photographer friends and I thought “we’re here, this place is still phenomenal, let’s just enjoy it”. On the second day we ended up at the hut, two or three hours later than everyone else, just because we spent all this time stopping, taking photos and really enjoying it to the full. We had a blast so you can’t let the weather get in the way, especially in New Zealand when the weather is so unpredictable. 'It’s all about the journey. There are so many different paths that you can take along that journey and some of them are fast and some are them are slow. Some of them are thin and some of them are wide. Yet they all come together, all those beautiful different paths. This unpredictability seems like a metaphor for life.' Talman Madsen. Lyzadie: You have been to many amazing spots in New Zealand. I want to know where you would recommend I go on the next adventure with my family? Also could you also tell us a bit more please about the quote you chose which is at the bottom of the page? Talman: With a family, I would say Lake Ohau. Lake Ohau is behind Twizel. To get to the township (if you can call it) is half an hour from the main highway. They’ve got a club skifield, they’ve got fishing, boating, stand up paddle boarding, bike trails. At the head of the lake you have four valleys coming together and so you’ve got all these opportunities for these incredible hikes. There’s huts all through there too. It’s a place that gets overlooked because the middle of the lake is the border between Canterbury and Otago so neither of them promote it very well. I often go and stay at the Lake Ohau Quarters, it’s like a barn stay and they have a big building, it sleeps up to 20 people which is really cool. They’ve got a wood fired spa. The quote, it sums it up. What it means is that I can’t control the opportunities that come my way but I can control how prepared I am. Sometimes that looks like always having my batteries charged, memory cards empty, caught up on the work so I can say yes to things or grab my bag and run out the door to chase some incredible light. Other times it’s having systems and processes in place and things line up. That’s really been a guiding force in my photography journey so far. Lyzadie: Thank you so much Talman for talking to me today. Keep doing what you are doing because it really inspires us and makes people connect with our beautiful country. Also thank you for sharing your beautiful photos. Have a great time on your next adventure - we cannot wait to hear and see more from you.